As discussed in the first part of our Summer Sun Series, the best defense is a good offense. 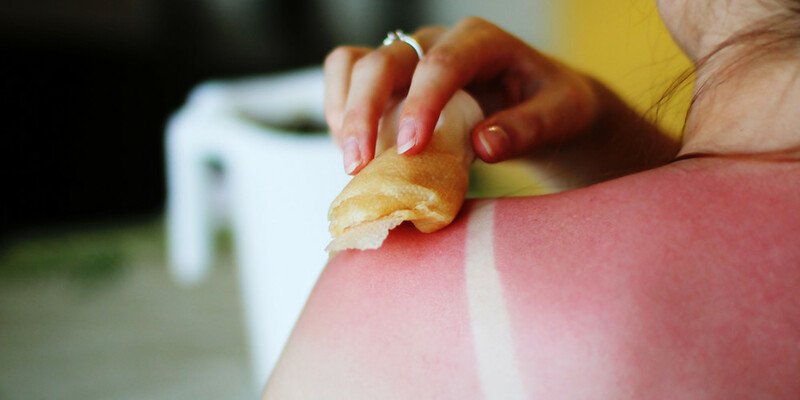 It is always better to avoid a sunburn in the first place, but even the most careful precautions sometimes aren't quite enough and we end up a bit on the crispy side. Here are some home remedies for putting out the fire of sunburn. Hydration: Hydration is key after a burn. Your body needs additional moisture to combat the drying effects of a sunburn. Drink plenty of water in the day or two after a burn to rehydrate. Cool water: A cool shower, bath or a cloth dipped in cool water can help to calm the heat of a burn. Just be careful not to soak or shower too long, or the skin can end up drying out too much. Keep your bath or shower to 15-20 minutes, avoid using soaps or bath products which can dry out the skin. Once you are done, don't towel off, but allow yourself to air dry. Aloe vera: Aloe has long been known to be one of Mother Nature's remedies for a burn. A fresh plant is always best, but there are many aloe creams and gels which can be found at your local store. To further boost the relief from aloe, refrigerate the plant's leaves or cream before applying. Oatmeal: Anyone who has had chicken pox as a child probably remembers being dumped into an oatmeal bath by their parents to help with the itching and discomfort. Oatmeal can also help with the pain and discomfort of a sunburn. You can either buy prepared colloidal oatmeal at your local pharmacy, or you can prepare it yourself. If making your own, take 1 cup of rolled oats (not the quick cook variety) and grind them into a powder with a food processor or blender. Prepare a cool bath and add the oatmeal to the bath while it is filling to evenly distribute it in the water. Soak for up to 15 minutes in the bath and try to air dry or gently pat yourself dry to preserve as much of the beneficial oils on your skin as possible. Repeat as necessary up to 3 times a day. Moisturize: Since the skin needs moisture to heal after a burn, making sure it is well moisturized will help it to heal more quickly and can help minimize peeling.